Contemporary Issues in Childhood provides undergraduate students with a comprehensive introduction to the current influences and challenges that surround childhood, families and communities. The text carefully explores the lives of children and young people to make clear the link between this particular demographic and social contexts such as family, community and society. 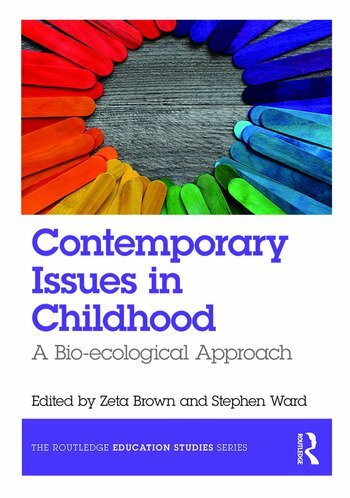 Key theories and concepts are examined in each chapter, using Bronfenbrenner’s bio-ecological model to highlight the complex and individual nature of child development. Written by highly experienced authors who represent a variety of professional disciplines, the book offers a comprehensive introduction to encourage critical reflection on the influences and experiences of children and childhood. A range of rich, practical examples accompany the text, in addition to discussion questions, case studies and further reading designed to support readers in reflecting on their own experiences as learners. Contemporary Issues in Childhood is essential reading for students on Education Studies courses and Childhood, Family and Community Studies courses, as well as preservice and in-service educators. It will also be of great interest to Early Childhood Studies and Special Needs/Inclusive Studies students. 5 Being mentally healthy: children and young people navigating their mental well-being. 7 Common vigilance: a perspective on the role of the community in safeguarding children. 9 How big is our society? Zeta Brown is Lecturer in Childhood, Family and Community Studies at the University of Wolverhampton, UK. Stephen Ward is Emeritus Professor of Education at Bath Spa University, UK.